Voltmeter is an instrument, which used for measuring the potential difference, or voltage, between two points in an electrical or electronic circuit. 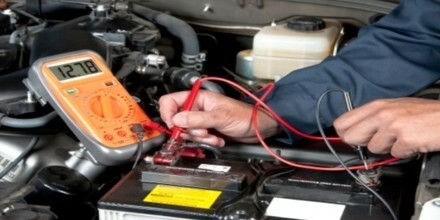 It is also known as a voltage meter. Voltmeter can display readings in analog (a pointer across a scale in fraction of the voltage of the circuit) or digital (shows voltage directly as numerals) form. Some voltmeters are intended for use in direct current (DC) circuits; others are designed for alternating current (AC) circuits. Specialized voltmeters can measure radio frequency (RF) voltage. 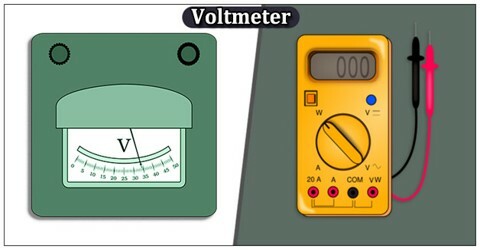 An analog voltmeter has an accuracy of up to a few fractions of a given full scale, and it is used to measure voltages from a fraction of a volt to a couple of thousand volts. 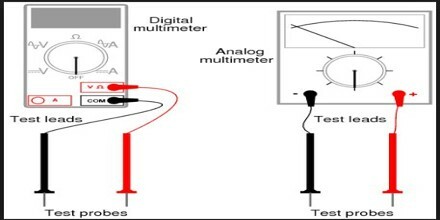 In contrast, a digital voltmeter has a higher accuracy and is normally used for very small voltage measurements in laboratories and electronic devices. The capability to measure voltage is critical to designing and maintaining advanced technology, but it also has more common and practical applications. Voltmeters are made in a wide range of styles. Instruments permanently mounted in a panel are used to monitor generators or other fixed apparatus. Portable instruments, usually equipped to also measure current and resistance in the form of a multimeter, are standard test instruments used in electrical and electronics work. Voltmeter can be mounted to a transformer and other such huge voltage devices, and it can also be portable in the form of digital multimeters. 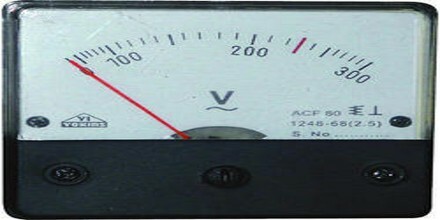 Analog voltmeter consists of a sensitive galvanometer (current meter) in series with a high resistance. The internal resistance of a voltmeter must be high. Otherwise it will draw significant current, and thereby disturb the operation of the circuit under test. The sensitivity of the galvanometer and the value of the series resistance determine the range of voltages that the meter can display. Voltmeters operating on the electrostatic principle use the mutual repulsion between two charged plates to deflect a pointer attached to a spring. Meters of this type draw negligible current but are sensitive to voltages over about 100 volts and work with either alternating or direct current. A digital voltmeter shows voltage directly as numerals. Some of these meters can determine voltage values to several significant figures. Practical laboratory voltmeters have maximum ranges of 1000 to 3000 volts (V). Most commercially manufactured voltmeters have several scales, increasing in powers of 10; for example, 0-1 V, 0-10 V, 0-100 V, and 0-1000 V.
In today’s modern world, voltage is used in many applications at many different magnitudes. Voltmeters that are made to measure dangerously high voltages, such as on transmission lines, have large probes with extra electrical insulation between the test points and the user in order to prevent the user from being shocked. Other voltmeters are made to measure very low levels of voltage on very small objects with intense precision, such as computer chips. Voltmeters for these applications can be very small, and are specially designed to minimize or eliminate unwanted noise from potential differences that exist in the air naturally, or due to nearby electronics. Voltmeters for measuring high potential differences require heavy-duty probes, wiring, and insulators. Reference: study.com, techopedia.com, techtarget.com, wikipedia.